Little is known about the origin and early evolution of the Notosuchia, hitherto unknown in the Jurassic period. 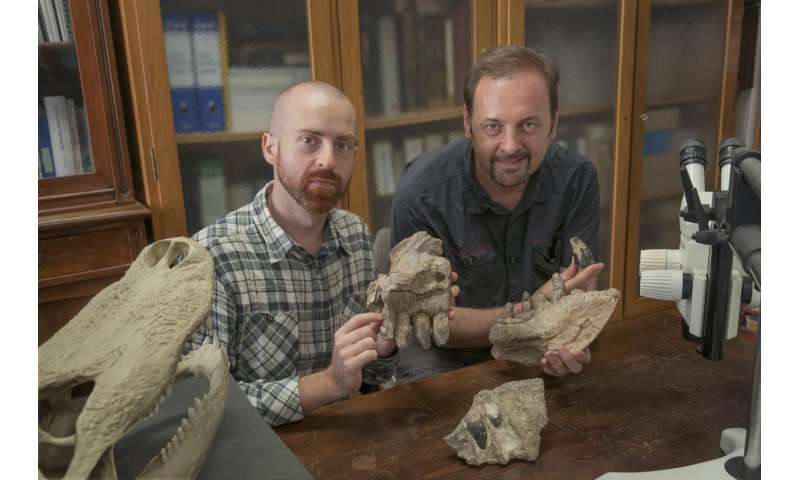 New research on fossils from Madagascar, published in the peer-reviewed journal PeerJ by Italian and French paleontologists, begin to fill the gap in a million-year-long ghost lineage. Deep and massive jaw bones armed with enormous serrated teeth that are similar in size and shape to those of a T-rex strongly suggest that these animals fed also on hard tissue such as bone and tendon. 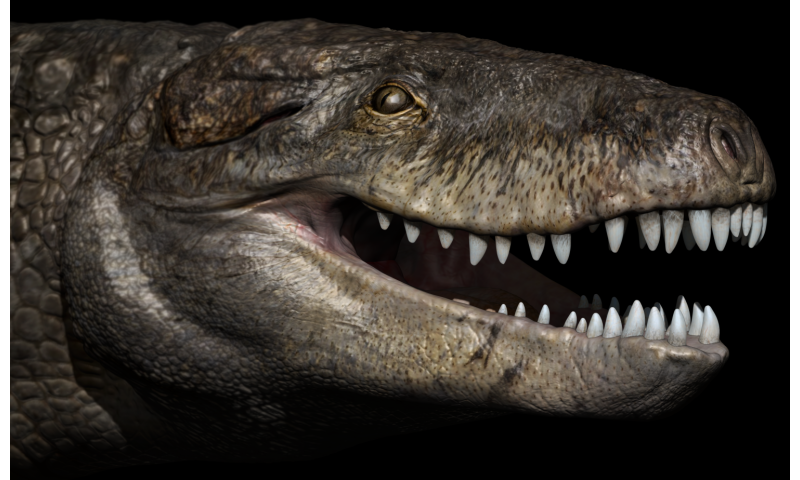 The full name of the predatory crocodyliform (nicknamed 'Razana') is Razanandrongobe sakalavae, which means "giant lizard ancestor from Sakalava region". A combination of anatomical features clearly identify this taxon as a Jurassic notosuchian, close to the South American baurusuchids and sebecids, that were highly specialized predators of terrestrial habits, different from present-day crocodilians in having a deep skull and powerful erect limbs. 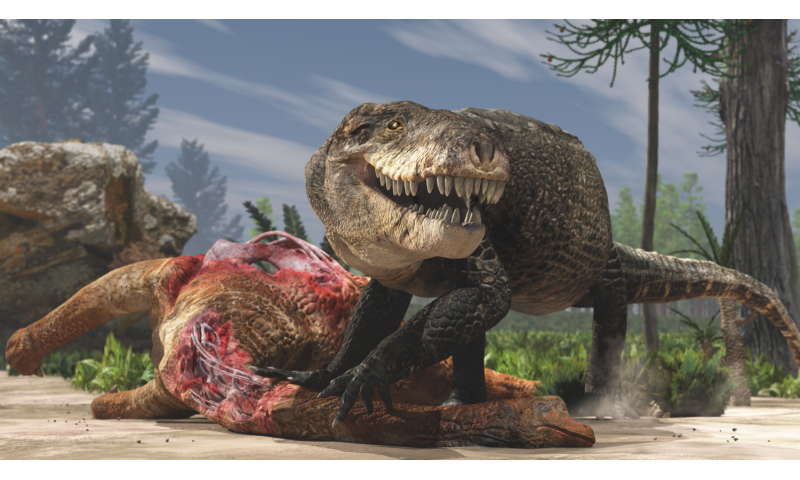 "Like these and other gigantic crocs from the Cretaceous, 'Razana' could outcompete even theropod dinosaurs, at the top of the food chain", says Cristiano Dal Sasso, of the Natural History Museum of Milan. Razanandrongobe sakalavae is by far the oldest—and possibly the largest—representative of the Notosuchia, documenting one of the earliest events of exacerbated increase in body size along the evolutionary history of the group. "Its geographic position during the period when Madagascar was separating from other landmasses is strongly suggestive of an endemic lineage. At the same time, it represents a further signal that the Notosuchia originated in southern Gondwana", remarks co-author Simone Maganuco. "Scientists have successfully used "reverse evolution" to engineer chickens with dinosaur snouts, feet, and even leg bones. While a Chickenosaurus seems like something from a spoof sci-fi movie, researchers have confirmed that they were successful in using "reverse evolution" to give modern chickens the features of their ancient dinosaur ancestors. In fact, scientists say that they are positive that they can create a dino-chicken in the future and are 50 percent there."